Former Luton striker Sam Parkin labelled his old club as 'phenomenal' as they head the League One table with just five matches left. 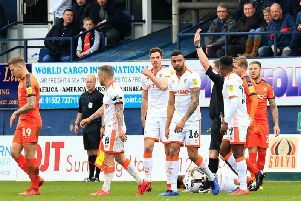 Yesterday's 2-2 draw with Blackpool for the Hatters, achieved thanks to Jason Cummings' late equaliser after James Collins saw red, coupled with Barnsley's defeat at Burton Albion saw the Hatters go eight points clear of the Tykes. Although Sunderland are just eight behind as well after winning at Rochdale, and Portsmouth 10 adrift, Parkin, who scored 10 goals in 56 games for Luton, was quick to praise the work done by his former manager Mick Harford, who took over when Nathan Jones left for Stoke City back in January. Speaking to the EFL show on Quest TV, he said: "They've been phenomenal and Mick's just steadying the ship. "I wouldn't imagine he's done too much on the training ground, I worked under Mick, he's a fantastic coach, obviously with scouting, so he would have played a big role in a lot of these players coming to the football club and what a squad they've got now as well,. "They added in January and it's going to be an opportunity for the likes of Cummings now going forward with Collins suspended."